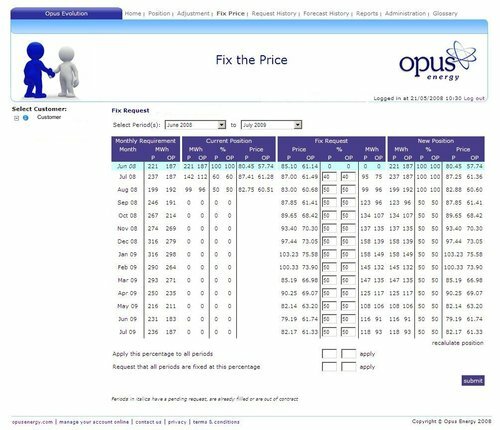 Opus Energy, a leading independent supplier of electricity to UK businesses, has today unveiled new advancements to Opus Evolution, its market-leading online energy purchasing system. With volatility in the energy markets, Opus Evolution allows customers direct access to wholesale energy prices, giving them the power to determine when and how much energy to purchase. This pioneering product is another example of how independent electricity suppliers like Opus Energy are developing new innovative technology solutions to meet customer needs and succeed in this competitive market. Launched just six months ago and offered exclusively by Opus Energy, this unique purchasing system provides the definitive alternative to the fixed price plan. This second stage of enhancements has been driven by customer feedback as well as meeting the growing demands of customers wishing to make crucial decisions themselves and move away from dependence on fixed pricing. To help drive the success of Opus Evolution, Opus Energy has bolstered its Corporate Solutions team with the appointment of Jon Daniels as Product Manager. Formerly with British Gas Business and Enron Direct, Jon brings with him seven years’ experience in commercial utilities. His key focus will be on engaging with customers who use the product, driving future development and helping Opus Energy grow its corporate base. Steve James, Commercial Director at Opus Energy, said: “Flexibility is essential to allow companies to optimize their purchasing strategies and help control the ever increasing cost of energy. Opus Evolution is at the forefront of this market and we will continue to look at further advancements to better equip our customers. Opus Energy is a leading independent supplier of electricity to UK businesses, based in Northampton. It has over 40,000 customers across the country, including Yell Group, Stagecoach, Thorntons, Farmfoods and Deloitte & Touche. Opus offers companies best-price electricity together with tailored customer care. Its flexible, tailor-made solutions suit businesses across the SME and larger corporate market. With offices in Northampton and Oxford, it employs 194 people. This press release was distributed by ResponseSource Press Release Wire on behalf of Opus Energy in the following categories: Business & Finance, Computing & Telecoms, for more information visit https://pressreleasewire.responsesource.com/about.